This year’s Hokies have been the definition of inconsistent. One week, it’s the defense. One week, it’s the offense. I would argue the Hokies have only had two complete performances this season – against William & Mary and against Duke. Other than those games, you either get the Hokies offense or the Hokies defense or neither. If the Hokies hope to make a bowl this season, they need to close the season with a couple of complete performances. This is the third consecutive game against a team with a strong running game. Hokies struggled mightily with Georgia Tech and looked significantly better against Boston College. They will need to be even better to stop the Pitt rushing attack. They are led by Qadree Ollison who leads the team with 819 rushing yards and 7 touchdowns. He is backed up by Darrin Hall who has big play ability and is averaging 7.4 yards per carry. He also had 229 rushing yards and 3 touchdowns against UVA last week. Pitt uses a lot of reverses and misdirection to confuse the opposing defenses. If the Hokies defense loses track of the ball carrier, then it’s off to the races. Pitt’s defense has been a very up and down this year – just like the Hokies. In some games, they have looked excellent and in others they’ve looked mediocre or worse. You never know what you’re going to get from this defense. Their performance last week against UVA was probably their most complete performance of the year. This defense is better at stopping the run than the pass but they have struggled with both at times this season. This defense is good at getting in the backfield to generate sacks and tackles for loss. Watch out for Rashad Weaver getting pressure on Ryan Willis. The Hokies remaining games are winnable but the Hokies need to put a complete performance together. This one isn’t a great matchup but it does look like a winnable matchup and the Hokies need to take advantage to get a win where they can. They need to avoid penalties and turnovers. If the defense shows up like they did against BC, and the offense can show up like they did against Georgia Tech, the Hokies should be in good shape. It’s difficult to predict games this year with a team as inconsistent as this year’s Hokies. If the Hokies want to get to a bowl game, this is where they need to go on the road and pick up a win in a place that’s been tough for them to get wins in the past. They are due for a complete performance. Georgia Tech is the one game so far this season that the Hokies shouldn’t have lost. They simply made too many mistakes and couldn’t capitalize when opportunities presented themselves. Most teams will have a loss or two like that each season. These are the ones who think about weeks later and know how close you were to a win. They are the difference between a good season and a great season. Either way, the Georgia Tech loss doesn’t greatly affect the Hokies postseason goals. Even with a win against Georgia Tech, their chances at a New Year’s Six bowl were slim. And they are still in the mix for the Citrus, TaxSlayer and Camping World bowls with two more wins against Pitt and UVA. The important thing will be to get the team refocused after two tough losses and take care of business against two teams that they should beat. The biggest issue that the Hokies will face from Pitt is their ground attack. Pitt uses a lot of jet sweep motion to spread out the defense then they run the ball with their big tailbacks. This is something that gave the Hokies trouble last season. Not to mention in their game against UNC, their quarterback scrambled more than he has all season. Expect this game to be like the Georgia Tech game. The Hokies need to stop the run and not get beat over the top. Pitt’s run defense is bad but so is the Hokies run game. So those two things offset each other. If the Hokies want to move the ball in this game, they will need to do so through the air against Pitt’s average pass defense. Pitt likes to use a lot of press coverage which has given the Hokies trouble this year. The Hokies young wideouts will have to find space against tight coverage and make plays. The best outcome would be for Cam Phillips to have a great day on Senior Day. The stats say Pittsburgh is somewhere in between Duke and North Carolina this season. Two teams that the Hokies blew out before they had their confidence stomped on by Miami. And before the recent rash of injuries the Hokies have suffered. On defense and special teams alone, this is a mismatch. The Hokies offense has been so stagnant in the last two weeks that it’s hard to expect much from them. And with the defensive injuries this past week, it’s hard to know what to expect from the defense. All I know is that Pittsburgh doesn’t pass the eye test to me. When I watched them last week, they looked a lot closer to UNC than they did VT. Even though it’s a bad matchup for the Hokies, they will find a way on Senior Day. The Hokies bounced back from the Syracuse loss in a big way against Miami. Now let’s see how they handle coming off a big win. The Hokies didn’t handle success very well last time. They immediately lost to Syracuse after a big win against UNC. Let’s hope we see more focus from the Hokies this time around. The Virginia Tech-Pittsburgh series is one of the weirdest you’ll see. The Hokies dominated in the 90’s and that flipped in the 2000’s. The Hokies went 7 of the first 8 games in the series. Pitt has won 6 of 7 since 2000. Unlike previous visits to Heinz Field, I think this visit will get the Hokies full attention. This Pittsburgh team will not sneak up on the Hokies this time. This game is the Hokies biggest remaining obstacle to a trip to the ACC Championship Game. What is Pittsburgh good at? Running the ball and stopping the run. The key to slowing down their offense will be to shut down their run game. Even if the Hokies do that, they need to be able to stop their mobile QB from making plays with his feet. He doesn’t run a lot but can break the pocket to pick up a first down or two. The Hokies need to be ready for that. Pittsburgh has the 5th ranked rushing defense in the nation. They are very good at stopping the run. If the Hokies hope to win this game, they will need to move the ball through the air. Pittsburgh ranks 122nd in passing yards allowed. You would think the Hokies should be able to throw against this defense. If the Hokies do pass a lot, watch out for Ejuan Price off the edge. He leads the nation with 9 sacks this season. On paper, the Hokies should win this game. But games aren’t played on paper. The last three times the Hokies have been to Heinz Field, they scored 6 points or less in the first half. This time they need to get off to a better start and put the Pitt offense and defense on their heels early. Unlike previous meetings, I think that Pitt has the Hokies full attention. I think you’ll see a much better performance than you’ve seen in previous visits to Pittsburgh. You can follow Zach on Twitter at @CzarOfPgh. As has been the case with basically every Pitt team I’ve watched, I have really no clue what to make of them. There have been some very positive signs. The defense, in particular the pass defense, has been night and day different than last year. Last year’s philosophy on defense suited Paul Chryst’s conservative personality quite well: bend but don’t break. Unfortunately, the talent level just wasn’t good enough to avoid breaking. This year, Pat Narduzzi has already implemented a tough, attacking defense. Starting cornerback Avonte Maddox has had a phenomenal season so far, and last year’s top recruit in Pennsylvania Jordan Whitehead has already seized the starting strong safety spot and is among the team leaders in tackles. On the downside, the run defense is still a work in progress. A large part of this is talent. Paul Chryst failed to recruit the d-line and linebacker positions very well. Still, it’s obvious that the new more aggressive scheme will pay off once the talent level begins to catch up in a few years. More troubling, the offense is suddenly a mess. Sure the loss of James Conner to injury and 60% of last year’s starting OL to either the NFL or season-long injury has been a major problem. A bigger problem, at least in my opinion, is a lack of a real identity. It’s not clear to me what the offense wants to be. At least with Paul Chryst you knew he wanted a power running attack. Thus far, Jim Chaney seems very hesitant to try to run inside, possibly due to the OL concerns. The problem is that the outside running game hasn’t been so great either. There have been a lot of East-West plays that never really develop. To go with those issues, Chaney quite obviously never trusted Chad Voytik to do… whatever it is Chaney wants to do. Nate Peterman has looked like he can make a lot of accurate throws, but he’s also been fairly turnover prone. I’m eager to see the offense develop into something with a real identity rather than random elements tossed together to see what works. I expect a fairly ugly game, especially if the weather is as expected. I know VT’s defense didn’t look like the elite unit it was expected to be against ECU, but I don’t think Pitt can do (or wants to do) the kinds of things on offense that ECU does. I’m terrified that VT’s talented defensive line is going to eat Pitt’s offensive line for lunch. Jim Chaney is going to want to establish the run one way or another, and that is going to be a tough order. Even if the weather were ideal, I’m not sure how well Pitt could pass against a great secondary and strong pass rush. In poor weather, it might be impossible. Unfortunately, I think a good passing game that keeps Tyler Boyd and the tight ends involved is going to be the best chance Pitt has to reliably move the ball. When VT has the ball, I hope to see an improved rushing defense. VT has a lot of talent at running back, and Pitt is going to need to hold their own in order to have any chance of winning. If the passing defense can keep up its improved play over last year, Pitt’s success is going to come down to how well they can stop the run. In an ugly game in wet weather, I can’t really say that either team has a clear advantage. Heinz Field is a house of horrors for VT, how do you feel about Pitt coming to Lane Stadium? To be honest, the thought of coming into a night game at Lane would terrify me. I want no part of that. Luckily, this year’s game is at noon. It’s hard to think of any stadium that’s truly intimidating for a noon game. Couple that with the expected wet, cold weather, and it’s hard to imagine much of a home field advantage for VT.
From the looks of it, Duke is going to be the class of the Coastal. They’re really playing great defense, and if recent history carries any weight, the offense will get going pretty soon too. They’re capable of easily winning the Coastal outright. Miami should be right up there with them, but it’s hard to have any faith in an Al Golden-coached team. They could easily collapse and lose several games that they shouldn’t. I also wouldn’t write off Georgia Tech either. They were too good last year to look so sloppy this year. I think they’ll still have a respectable finish. What I am trying to say here is that I think Duke probably wins it but everyone has a good shot of finishing well. Except Virginia. Ugly. Maybe not Mizzou-UConn ugly, but pretty bad. These are two flawed teams that have been forced by injury to reconsider what their strengths are. A noon game in wet weather isn’t going to help them figure it out. I expect Virginia Tech to pull out a victory because they’re more talented on defense. If Pitt can figure out an offensive recipe that works–and it was in the VT game last year that the light bulb went off for the offense–then they have a good chance. Still, VT is the more talented team, so unless they get unlucky in the turnover department, I’d expect VT to win close. Why can’t the Hokies have an SEC-sized offensive line? It seems whenever the SEC plays, I see Hokie fans on message boards and on Twitter pose the question, “Why can’t we have an o-line like [insert SEC team here].” In a recent Twitter conversation with @hokiesmash, he posed the question why can’t the Hokies have an offensive line at least as good as Pitt or BC’s? Pitt and BC might not be the gold standard for great offensive play but they are consistently good in the ACC and should be a model for the Hokies to follow. 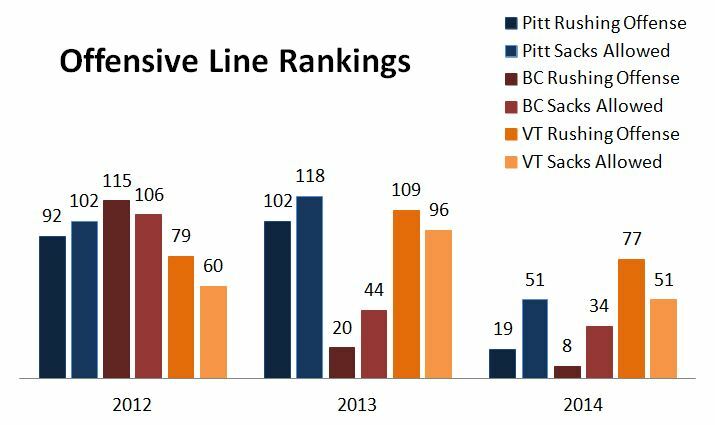 So the question is, why are Pitt and BC’s offensive lines better than the Hokies? Let’s look deeper into if that’s true and if so, why? Where do Pitt and BC recruit their linemen from and how talented are they perceived to be when they enroll? 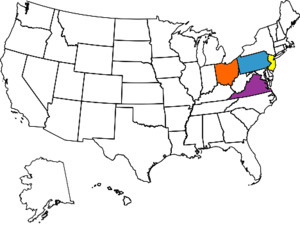 Do the Hokies recruit the same areas as Pitt and BC? Yes. All three schools have recruited the Northeast and Mid-Atlantic. Do the Hokies have roughly the same recruiting success as Pitt and BC? Pitt’s offensive line recruiting has been better than both BC and VT. Pitt has one 5-star and two 4-star offensive line recruits. BC and VT have no 4 or 5 star offensive line recruits. How have the results been different on the field been different over the last 4 years? Boston College has by far been the most successful team on the offensive line. The 2012 season was nightmare that they rebounded nicely from. Pitt has not been better than the Hokies for the last two years before a huge improvement this year (hello James Conner). For the Hokies, 2012 was a mediocre year on the offensive line. 2013 was downright awful. So far, 2014 has been a return to mediocrity. So what does all this tell us and what do the Hokies need to do? Well, out of the three teams analyzed, the Hokies are definitely getting the least out of their recruits. You can blame it on coaching transitions (three coaches in the last three years) or you can blame it on the quality of those coaches. I do not have enough insight into the program to give you the answer to that question but the level of production is clear. So what’s the answer? In my opinion it’s two-fold – pick a fertile recruiting area where you feel like you can be successful then get those recruits to sign with your program. Stacy Searels appears to be favoring the Southeast (Virginia to Florida) but he has gone as far as Massachusetts for a recruit. 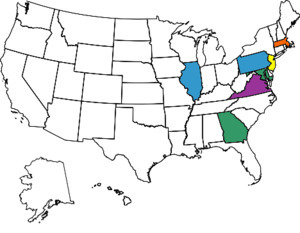 The biggest issue is picking an area where the Hokies can win the recruiting battles. It doesn’t make sense to spend a lot of time recruiting guys in the South who are going to the SEC anyway. It would seem like the low-hanging fruit would be recruiting the Northeast and Mid-Atlantic but if Stacy Searels feels like he can be successful in the Southeast – I hope he feels like he can close the deal with those recruits. Otherwise, the Hokies will not be getting any better on the offensive line any time soon. Virginia Tech will not be successful with the SEC’s leftovers. 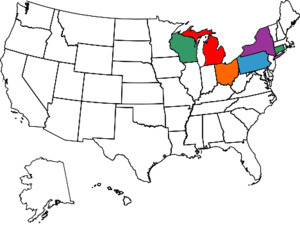 They are better off following Pitt and BC’s example by recruiting the Northeast and Mid-Atlantic. Then have some stability on the coaching staff to get the most out of those recruits.